Most experts sway in the same direction on the 2013 version of the Pilot. It seems most have reached a point of dull disinterest. They are impressed with its conveniences and disappointed by its capabilities. "The 2013 Honda Pilot disappoints behind the wheel, but its supreme utility shouldn't be ignored." (Edmunds) That's not incredibly high praise for a midsize SUV that can top the $40K mark well-equipped. While most owners still praise its utility, there are those who are now concerned with Honda quality. "I really enjoy this car, however I have been a little annoyed with the [number] of recalls since owning it. Time isn't a luxury I can afford." (Review from Kentucky owner, KBB) While there have been no major safety recalls on the 2013 Pilot, there have been a couple of minor recalls on a limited number of vehicles. This isn't the kind of quality Honda has come to be known for. "Excellent driving vehicle, superb handling and the Pilot is a quality SUV for the money. They are just a bit behind in the technology department with the competition. They need to offer more safety features on the touring model (i.e. blind spot indicator, LED headlights and easier controls)." - Owner review from Rob in Virginia, KBB. The 2013 Honda Pilot comes in four trim levels: LX, EX, EX-L, and Touring. It's sort of like a combo meal at your favorite drive-thru, except supersizing this meal could require a second mortgage on your house. The LX trim starts off with a nice amount of standard features. It includes automatic headlights, full power accessories, cruise control, tri-zone automatic climate control, Bluetooth phone and audio connectivity, a rearview camera, and a seven-speaker sound system with CD player and USB/iPod/aux interfaces. Bumping up a notch to the EX will switch the wheels to 18-inch alloys and add some other standard features, such as heated mirrors (on the AWD models only) and an eight-way power driver's seat with two-way lumbar adjustment. That moves us up to the EX-L, which offers leather upholstery, a sunroof, heated front seats, an auto-dimming rearview mirror, power liftgate, and satellite radio. A rear-seat entertainment system and navigation system are both optional but don't come on the standard equipment list. The final step up in the 2013 Honda Pilot trim levels is the Touring edition. It includes the entertainment and navigation systems as standard options, and it throws in a set of roof rails, driver-seat memory functions, parking sensors, and a 10-speaker premium sound system. All of this comes with the standard spacious cabin that seems to be the highlight of the Pilot's world. While there's no denying the amount of comfort and functionality the interior of the 2013 Pilot possesses, it is only average when it comes to overall quality. Much of the dashboard and door panels are festooned with hard plastics of bland colors and sharp corners. The cockpit features a three-eye display, but it doesn't feature much in the way of information aside from your speed and how much gas is in the tank. There is no denying the spaciousness of the interior as even the third-row seat could house a full-grown adult comfortably. Seating is supportive and comfortable but sits rather low to the ground, especially for passengers in the six-foot-plus area. Some drivers have complained of the limited rear visibility; the boxy body of the Pilot helps this problem slightly, but the massive rear headrests on the second- and third-row seats cancel any of that help right out. Cargo capacity is slightly above average for the class at 87 cubic feet with the second- and third-row seats stored. That number drops to 47.7 cubes with the second-row seat in place, and it falls to 18 cubic feet behind the third row. The real cargo space is found throughout the cabin in small, handy compartments that make storage for long trips a lot simpler than it could be without them. No matter what variety or trim level you choose, the 2013 Honda Pilot comes only with a 3.5L V6 engine that pushes out 250 horsepower and 253 ft.-lbs. of torque. It comes coupled to a five-speed automatic transmission that performs on par with its normal everyday duties, shifting smoothly and not straining under a load. Front-wheel drive comes standard but all-wheel is available as an option. It's an electronic all-wheel drive that shifts 70 percent of the power to the rear wheels any time a slippage is detected. Towing capacity for the front-wheel drive models tops out at 2,000 lbs. If you bump up to the all-wheel line you'll raise that towing capacity to 4,500 pounds. Judging by the overall performance of the V6 engine, however, you probably won't want to be towing much, if anything at all. It is a capable engine but always feels underpowered. Give yourself some extra time if you need to pass somebody because it takes the Pilot a minute to build a head of steam. Handling is sloppy and makes it feel like you're driving around in a cement block on wheels. The Pilot's size gives it a cumbersome feel and makes it awkward in tight spaces. On the other hand, if you're simply peddling around town or taking that vacation on a long, stretching highway, the Pilot provides a pillow-like ride that virtually eliminates bumps in the road. You will definitely hear everything that goes on outside though, as road noise is still a major disappointment. Braking power remains insufficient as well. The 2013 Honda Pilot is an IIHS Top Safety Pick, earning top marks of Good in all their crash tests. The NHTSA also gave it high marks, donning upon it four out of five stars overall and a perfect five out five stars in side crash tests. There are currently no major safety recalls, but as we said before there are a few minor issues here and there, which seems to be the norm for Honda as of late. Although Honda once meant pure quality, it is now swimming in the middle of the pool. It was rated with a score of 3 out of 5 in J.D. Power and Associates dependability study. 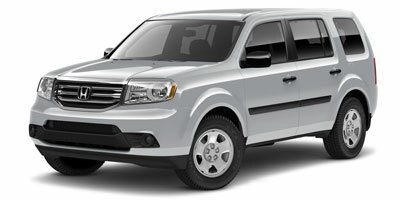 MSRP on the 2013 Honda Pilot ranges from $29,520 to $41,270 for the upper-line Touring edition. Interested to see how the 2013 Honda Pilot ranks against similar cars in terms of key attributes? Here are the 2013 Honda Pilot rankings for MPG, horsepower, torque, leg room, head room, shoulder room, hip room and so forth.